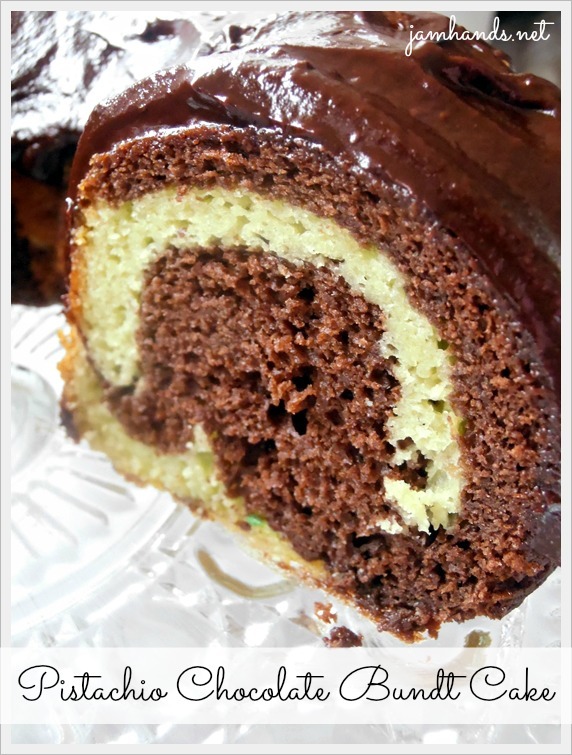 My final recipe for St. Patrick's Day is this cute Pistachio Chocolate Bundt Cake. It is very moist and while I originally made a chocolate ganache for a topping, I think a light dusting for powdered sugar is equally good. I am not a huge fan of chocolate so I prefer the powdered sugar on top but you can frost it with whatever suits your taste. As with almost all bundt cakes, these taste best the day after they are made, so try to make it the day before you plan on serving it. 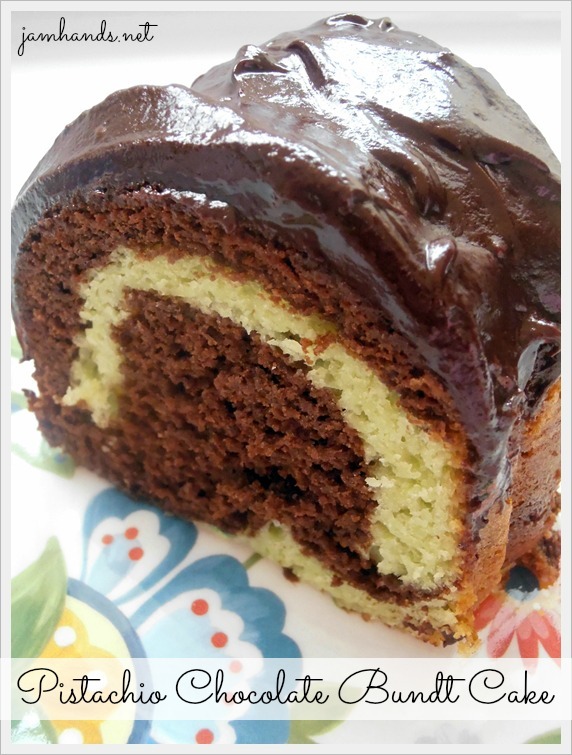 While I was researching which recipe to try for this, I noticed a trend of people commenting that other cakes they had tried had not enough of a pistachio flavor to them. I used two packages of pistachio pudding mix to fix this. I also used a French Vanilla cake mix, but you can use white as well. Enjoy! 1. Prepare bundt pan but buttering and flouring or spraying well with baking spray. Preheat oven to 350-f degrees. 2. In a large bowl, blend together the cake mix, pudding mixes, water, milk, oil and eggs. Mix with an electric mixer for several minutes at medium speed. 3. Divide the batter evenly between two bowls. To one of the batters, add the cocoa powder and chocolate syrup and mix well. 4. Using two separate measuring cups, one for the chocolate batter and one for the pistachio, layer in the batters. To do this, scoop one dollop of batter into the bundt pan. For the next dollop, pour it over half of the previous scoops batter and half onto the bundt pan. In essence you are overlapping the batter layers. Continue until all the batter is gone. Tap the bundt pan to level out the batter. 5. Bake for about 50 minutes, until a sharp knife comes out clean when tested. Let cool. You can garnish with powdered sugar (recommended), or with a chocolate ganache. Adapted from recipes at Food.com and Heidi's Recipes.